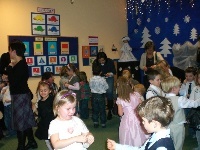 Christmas is one of the most important Day in polish traditon. we all look forward to those most familiar holidays, whent time flows differently. Inseparable part of the upcoming holidays are our meetings at the Christmas tree hedl every year in our kindergarten. This year, in each group, they weren't similar, but all there was a nice Christmas mood everywhere- becaus of performances prepared by children, sharing the Holy wafer, Christmas carols common singing. Those meetings with families and children around the Christmas tree create a unique atmosphere full of closeness and warmth. They are wonderful and emotional experience remaining in memory.for a long time .